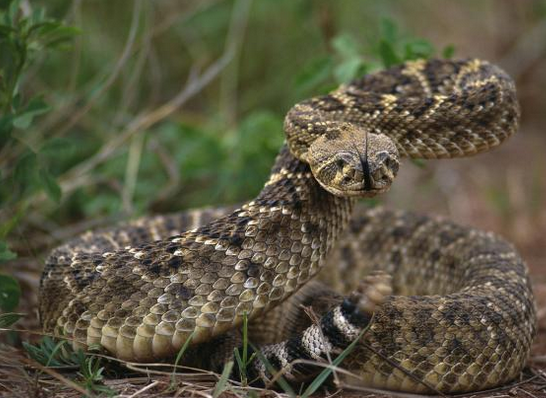 Have you ever wondered how the average rattlesnake hunts and attacks its prey? Not human prey— most snakes are not aggressive toward people unless startled or provoked— but their usual food of frogs, lizards, mice and other rodents? Snakes are often thought of as incredibly stupid eating machines, but it turns out that the more you look at snakes, the more sophisticated their behavior becomes, according to recently published findings in the Journal of Herpetology. Normally, rattlesnakes rely on ambush, sitting back and waiting for the prey to come within reach before a lightning-quick strike with their fangs. Sometimes they even use their tails as bait, wiggling them slightly as a worm-like lure for creatures such as skinks that would be attracted to worms. After the initial strike, and depending on the type of prey, snakes might hang back and wait for the venom to take hold. When you think about it, this is a smart plan for vipers because their prey might attempt to strike back at them after being bitten. Scientific studies provide insight into the ways venomous snakes adapt to the behavior of their dangerous prey. For example, centipedes are armed with two venom-filled front legs that often act like fangs. As you might expect, centipedes don’t exactly go through life expecting problems. In fact, the creatures—which appear to have traded brains for legs—often let the snakes come right up to them, and sometimes even went so far as to crawl over the reptiles! Snakes seemed to have a healthy respect for the risks involved with centipedes but they will certainly aggressively attack them. Observations show that the reptiles would often approach the centipedes with a raised head—potentially to keep their eyes and sensitive scent organs out of the centipede’s reach. Snakes don't need to be that careful with your average mouse! Snakes can even get the best of their prey AFTER death. Snakes—like many other reptiles—retain their reflexes even hours after death. The bite reflex is extremely strong in venomous snakes, because their instinct is to deliver one extremely quick bite, move away, and wait for their venom to work. The bodies of snakes often writhe around for some time after they are dead. It’s a similar reflex to that of a headless chicken running around for a short time after it is decapitated. The mechanism behind this eerie behavior is a nervous system pre-programmed to make certain movements without the brain needing to send a signal. And a decapitated venomous snake head is evidently pre-programmed to bite in response to a stimulus—such as a someone trying to pick it up. So if you see a rattlesnake in your backyard, for example, and you grab a shovel and kill it, you should still beware! If you go to dispose of it, the severed head could still bite you! No kidding! Of course the vast majority of snake bites in the U.S. are the result of people messing around with the creatures, so its best to simply leave a venomous snake alone. If you need to move one from your property or a public area, call an expert to humanely move them since snakes play valuable roles in the ecosystem and deserve respect as wildlife. Prevention is best. Wear snake gaiters or snake boots or full protection snake chaps when out hiking, hunting, or working around timber. Then if you do encounter a commen Western diamondback rattlesnake, for example, you will be protected if it perceives you as a threat and strikes.